With the release of Steve Jacksons game plastic OGRE miniatures I was thinking do you really have to use the "approved" figures to have a game? 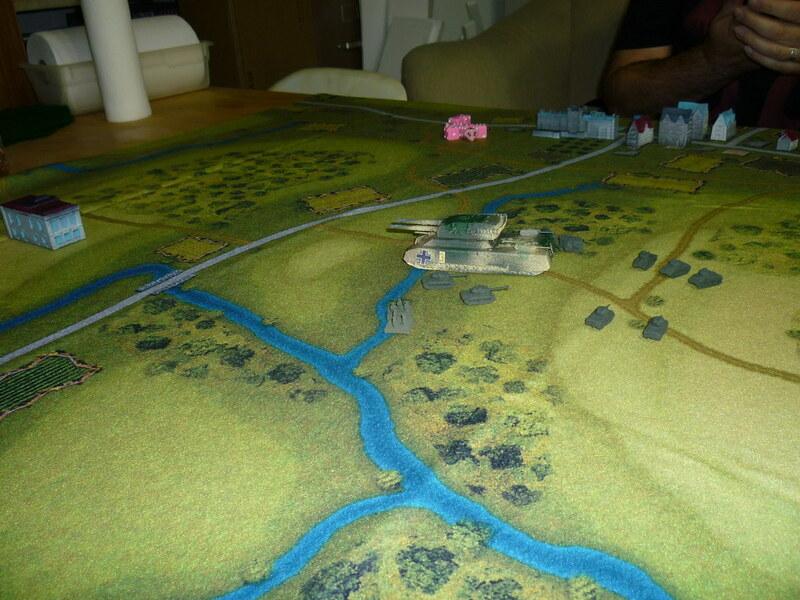 I had done a 3d file in CAD a bit back for a German P1000 Ratte and decided to play OGRE as a Weird War II action. I am sorry about the pictures I had no idea the room was that dark and normally my digital camera would flash to compensate but I guess it had an off day. All the miniatures are 1/285 scale and 3d printed on my FDM printer. 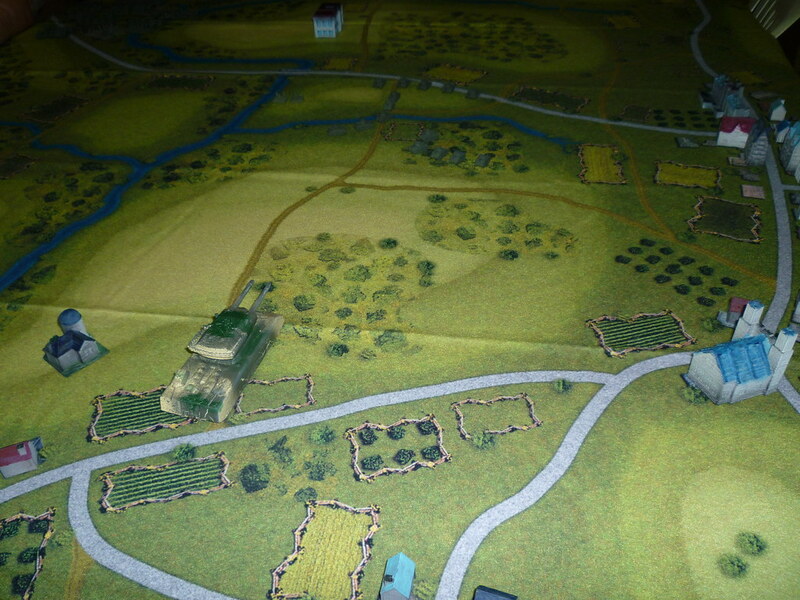 During the final days of the campaign in Europe the American forces are roused by another German attack on the front. Der Fuerher has ordered the release of the "Wonder Weapon" upon the Americans to give them what for. Alber Speer unknowingly orders to not build the Ratte have been overridden and the beast is now unleashed! 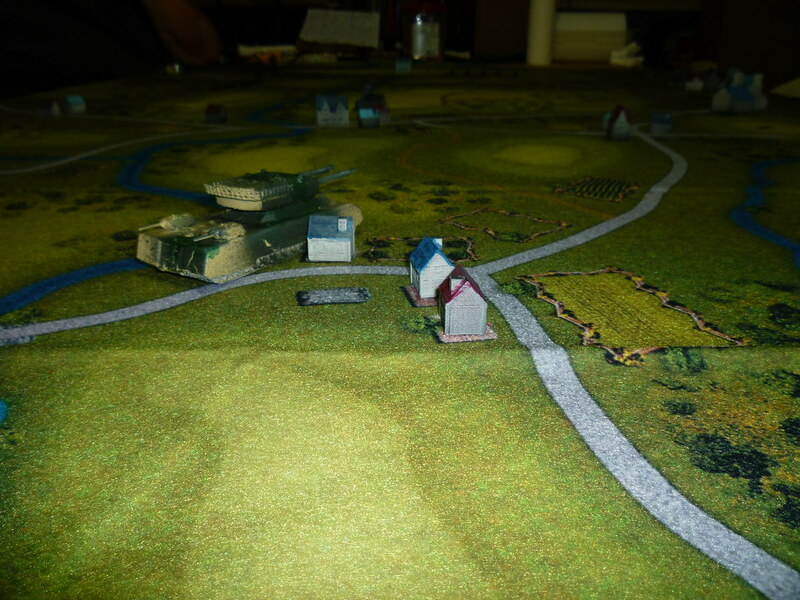 The Ratte rumbles past some farm houses on its way to demolish the American HQ, its objective. The American commander shocked by this marvel of German engineering and audacity rallies his meager force of Shermans, Pershings and infanty. Moving ever forward the monster vehicles moves menacingly toward the HQ. Quick boys! The General is having pot roast with dignitaries and rumor is there are going to be lots of left overs for the troops! Defend the HQ! The Ratte rumbles ever closer main guns preparing to unleash their fury. The Americans dare to stand in our way, open fire with all guns! The initial attack is devastating and several Shermans going up in flames with some being all but obliterated. The shocked Sherman tanks fire back ineffectively, uh oh. The Germans heartened by this charge into the American forces, we shall squash them like the insignificant bugs they are is what the Deutsch are thinking. The American commander shouts at his troops if you don't start fighting we are going skid marks on that things treads! Give em heck boys! 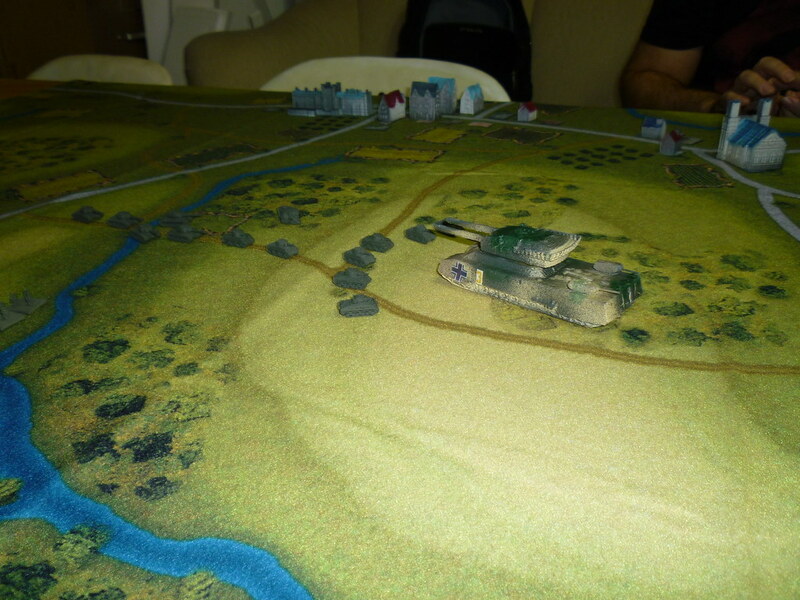 Several American tanks are crushed by the mighty behemoth but the defensive fire is punishing. The Ratte shudders and starts to slow as well as losing many weapon systems. The mad battle approaches its climax as the monster moves ever closer to the HQ. 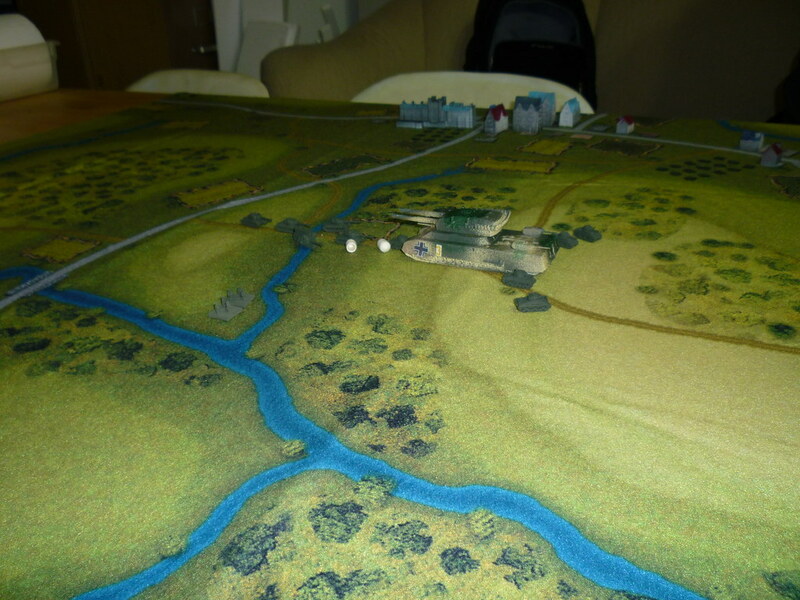 The American infantry forces come up to assist. 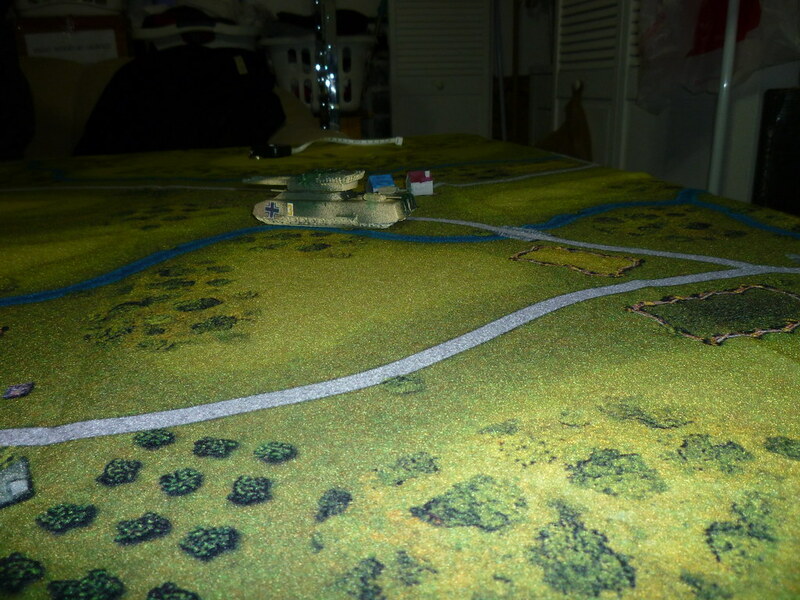 The battle is fierce and the American infantry close assaults the Ratte and is entirely destroyed, but not before fatally wounding the beast. Many more American tanks are crushed beneath the great treads of the Ratte but the damage is done and the Ratte rolls to a stop, all mobility killed along with its suicidally reckless crew. Calms reigns on the battlefield, "Heck of a way to get some pot roast eh boys?" An excellent adaptation. Thank you! Neat idea – thanks for posting! Very cool. Where's the mat from? 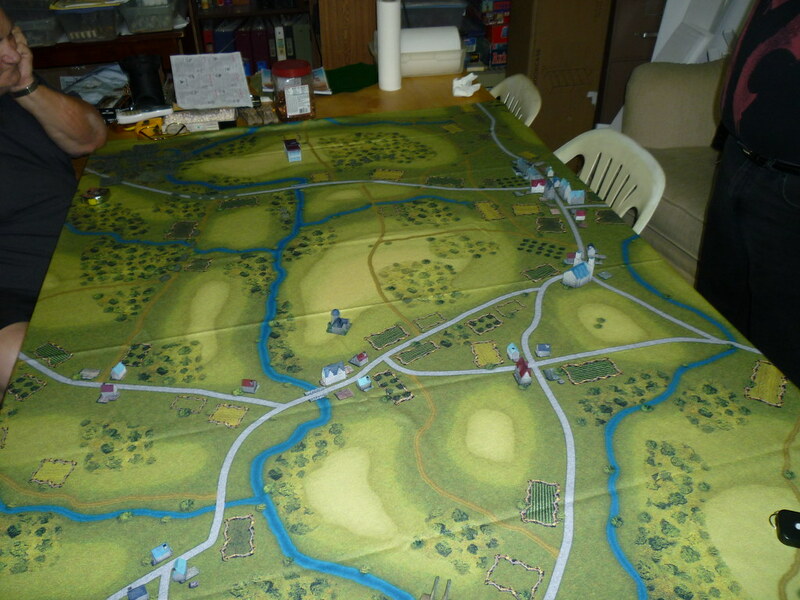 It's a Cigar Box battle mat, from one of the civil war battlefields. I have had it a while but it is a very nice product. Looks like a good game. 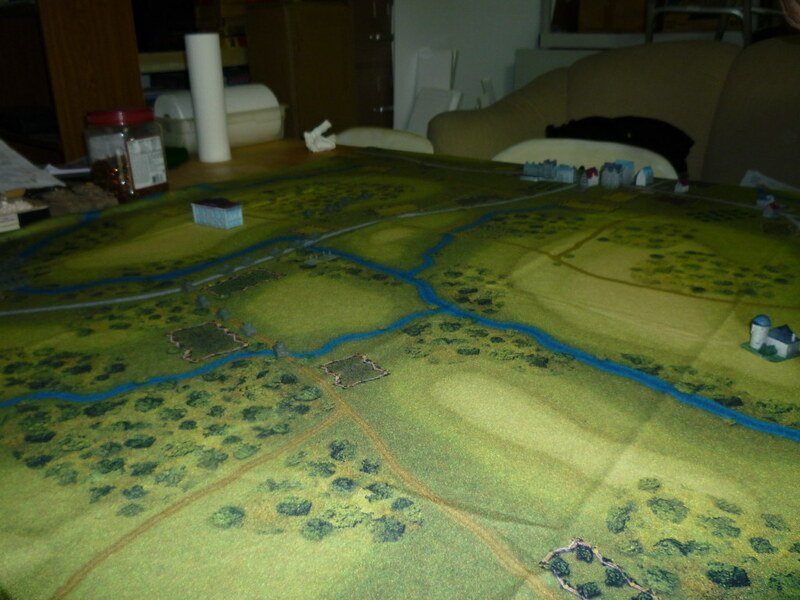 Looks like the ACW Pipes Creek mat, either the full campaign one or the 15mm east mat. 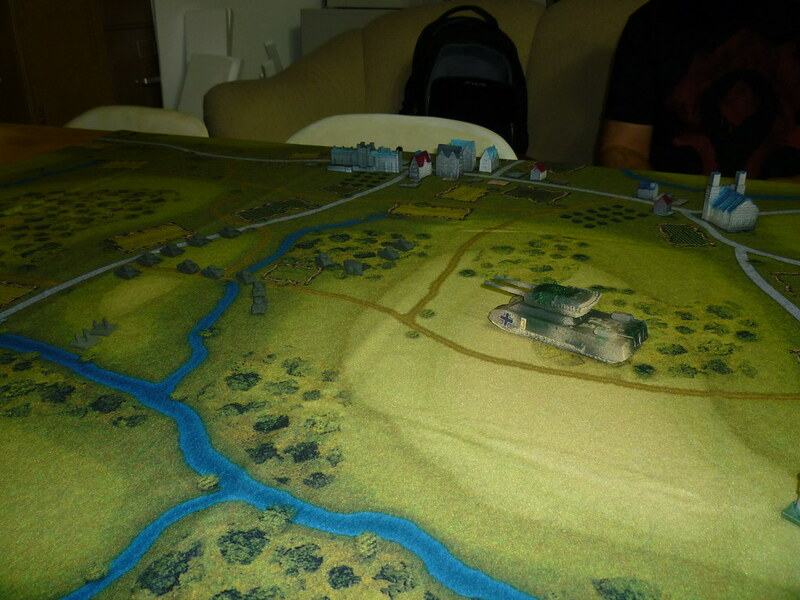 Friend of mine has both of the 15mm mats and we played several battles on them. 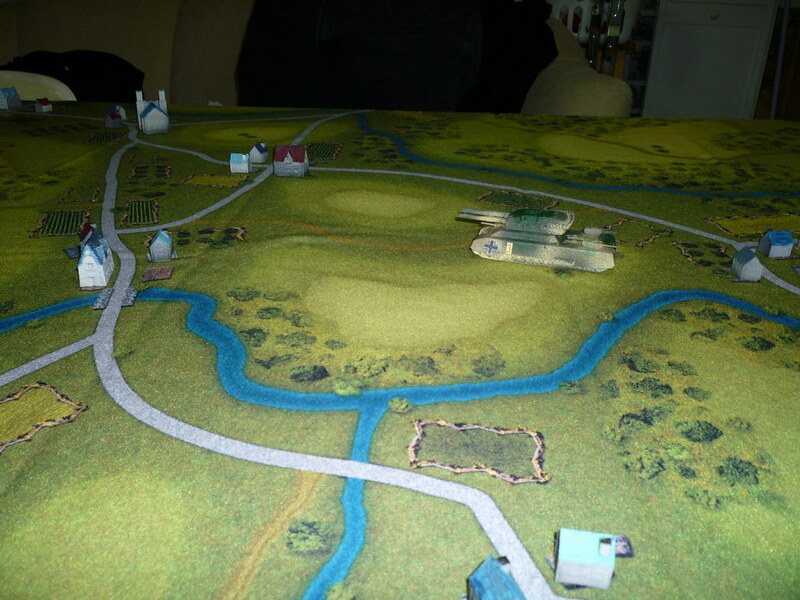 They are pretty good general terrain maps even though the hills and woods tend to block many long range shots. With the release of Steve Jacksons.. plastic OGRE miniatures.. do you really have to use the "approved" figures to have a game? IMHO, 'Your mini's, your friends, your decision'. All the miniatures are 1/285 scale..
Wow, I would have believed 15mm. I'm not that familiar with 3D printing, what is "FDM"? FDM stands for fused deposition modeling. The majority of 3d printers for sale to the public are this type. I made all these models with CAD and then converted the files for 3D printing. If you are interested I do sell these. 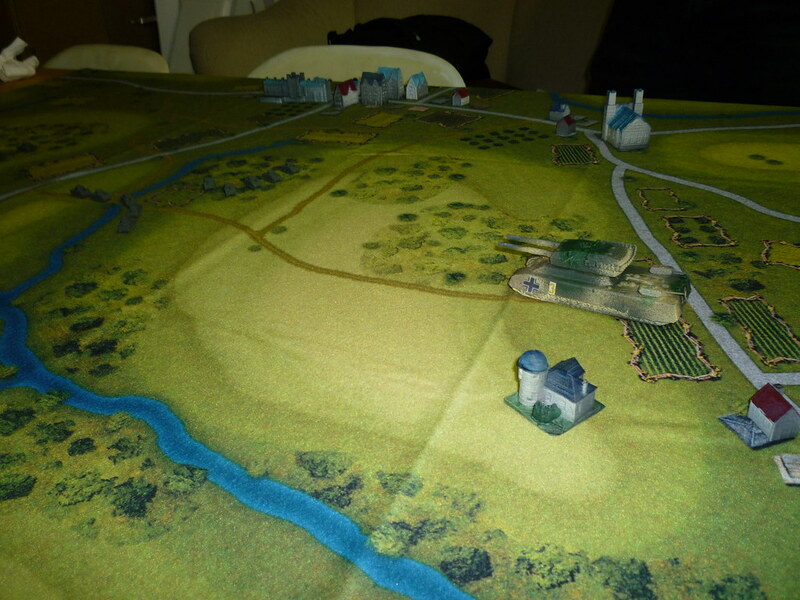 Other than the battle mat everything, including the buildings was made on my 3d printers. I have been watching 3D tech over the last cpl of yrs., perhaps the next stage of gaming. I'm more familiar with seeing "WSF", (white soft flexible) as it seems to be the more common material used. However, its said to leave a "slight grainy feel/texture" to the model. That is the one factor that has kept me away from 3D and the price for 'some' (outlandish). No doubt in time, better materials will become more available and cost effective, that will give a much smoother traditional model like finish. While I'm not looking to buy any 3D at this time, I'd be very interested in seeing some of your work if you have a website or site on Shapeways. Great revival of a school-days favourite with a twist. Finally, an application for Hitler's super tanks !